If you’ve ever felt lost, you’re shooting par for the course as a human being. Everyone faces this challenge sooner or later. 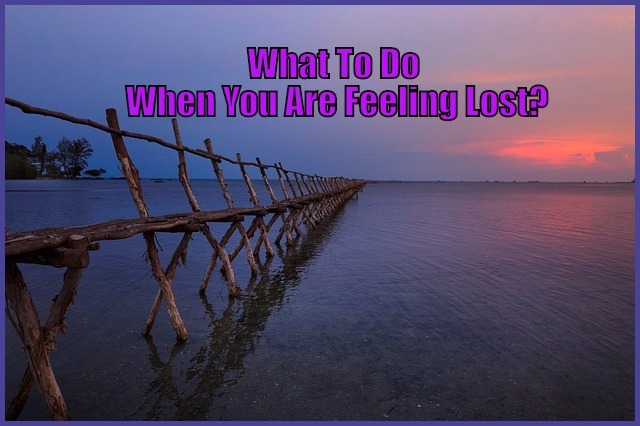 Feeling lost is a sign that you believe your life is on the wrong track. You feel like your life lacks meaning and that your future is uncompelling. This is a great time to take a long, hard look at yourself. You can learn a lot during this period. 1. Make a list of things you’d like to see in your lifetime. One of the reasons you feel lost is that you don’t have anything to look forward to. You can change that quickly by making a list of all the things you’d like to see in your lifetime. Here are a few ideas to stimulate your thinking. Make your own list and don’t be bashful. Now pick one thing you can do in the next six months. If your list is too extravagant, and six months is an impossible timeline, think harder and add more items to your list. 2. Make a list of things you’d like to do in your lifetime. What would you like to do or learn? Play bridge or chess? Speak Russian? Master the piano? Go waterskiing? Learn to paint? Take a zipline through the Costa Rican jungle? Think of something you can do in the next few months and start making plans. 3. Revisit your old goals. You had a lot of plans when you were a kid. You wanted to be a cowboy or an astronaut or raise llamas. You had more realistic plans as you aged, but you still had plans that interested you. Perhaps you can rekindle some of that enthusiasm by revisiting those plans from the past. Think about why you abandoned those plans. Maybe the reasons you changed your mind are no longer valid. Maybe they were never valid in the first place. 4. Realize that your feelings aren’t unusual. Your current mental state is quite common. How many people make the right choices consistently? Nearly every adult wishes they could go back and choose a different career. This includes doctors, lawyers, and successful business owners. Mistakes pile up over the years, and in your mind, the grass is always greener somewhere else. This is all a part of the human experience. The next part of your experience is working though it. 5. Realize that you have a lot of control over your situation. It’s easy to feel hopeless, but you have a lot of choices available to you. It’s a matter of being brave enough to choose the best one and run with it. 6. Find the limiting belief. There are plenty of things you want to do, you just don’t think you can do them. You might believe that you’re too old, need more education, lack the necessary finances, and the list goes on. Look at your limiting beliefs and work through them. Feeling lost is synonymous with lacking direction. Finding a new direction for your life is the key to stop feeling lost. Find a few things you’d like to do and see this year. Plan a future that you find interesting and exciting. Once your mood is lifted, you’ll see the world with new eyes and be able to find new opportunities that excite you. Can you really change your life with a 10-minute MP3?